President Obama says he can’t wait to take the custom rebuilt drone out for a spin. WASHINGTON—Taking his time to thoroughly clean a pair of replacement carburetors and install them on a turbocharged Rotax engine as classic rock tracks blared from a nearby transistor radio, sources confirmed that President Barack Obama spent most of Wednesday afternoon in the White House garage continuing his restoration of a vintage military drone. 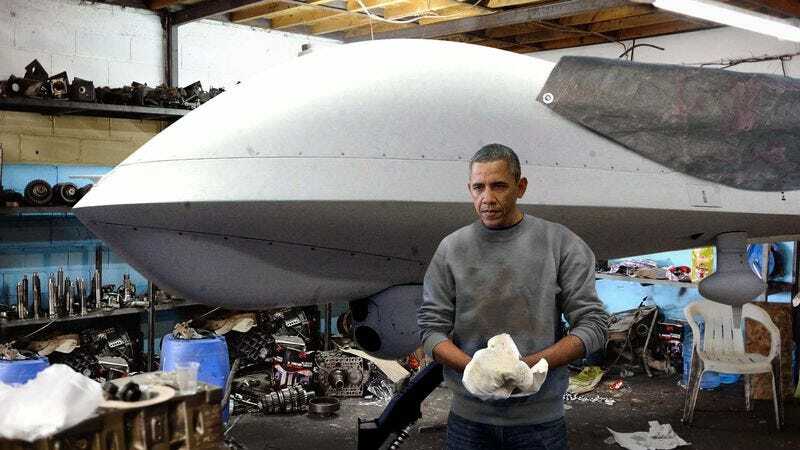 Pausing every so often to admire his work, the president, dressed in jeans and a grease-stained Champion sweatshirt, explained that he has been tinkering with the 1995 RQ-1 Predator since acquiring it from a military scrapyard two years ago. The commander-in-chief said he considers the salvaged unmanned aerial vehicle a prized find, as the United States only produced 12 of the classic airframes for their inaugural deployment in the Bosnian War. “With a set of souped-up avionics like that, you can really open her up once you hit international airspace,” he continued. Obama boasted that the finished work would harken back to the “glory days” of drones, when he says American ingenuity dominated the skies over the Balkans. Noting that back in that era Predators were the drone of choice for Operation Nomad Vigil, the nation’s chief executive reflected on the machines’ superior handling and reconnaissance capabilities, lamenting that today’s newer models with their “flashy AN/AAS-52 Multi-Spectral Targeting Systems” seem only to be focused on precision strikes against high-value terrorist targets. The two-term president told reporters he does not intend on selling the drone once it is finished, acknowledging that in addition to its sentimental value, he likes the idea of taking it out for a spin on the occasional Sunday morning or showing it off to some of his older NATO buddies who remember the vintage UAVs from back in their earlier peacekeeping days. According to sources, after testing and recalibrating the propeller, the president spent another hour cleaning up the scraps of metal and foam shavings from his worksite. Observers say Obama then stood in the doorway staring reverently at the drone for several moments before turning off the light and slowly heading inside.